Football : Can O'Neill & Keane pull it out of the bag? Like me, many Irish supporters thought that we were already on the road to the World Cup in Russia, 2018. However, the performances in the last two games have left a lot to be desired. Ireland were very poor against Georgia in their first game at the beginning of the month and they then followed that up with a loss against Serbia. The performance in the Serbia game was a lot better than against Georgia but as we all know it's results that matter. Ireland currently lie in third place in Group D on 13 points, behind Serbia in first place on 18 points and behind Wales who are in second place on 14 points. The Serbians are all but guaranteed at least second place providing something drastic doesn’t happen such as losing their final two games against Austria away and Georgia at home early next month. All of Ireland will be hoping that Georgia can do them a favour when the Welsh travel to Tbilisi. Ireland will be expected to beat Moldova easily enough on the same match day on October 6th. A win for Ireland and a Welsh draw in Tbilisi would mean Ireland would just need a draw in Cardiff three days later. However, when a team goes out to play for a draw the opposition can be very dangerous and if that is what this Ireland are going to try then Wales will take advantage of it with players like Bale and Ramsey. So realistically Ireland should go out and try to win the two games, because let's face it, the Welsh game is 50-50 in my eyes anyway. 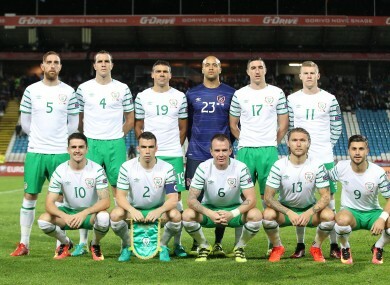 Martin O’Neill and Roy Keane may give more players opportunities though, Glenn Whelan is not up to it in my own opinion, way off the pace for international football. People will argue with me on that and that’s fair enough. Wes Hoolahan, who many have suggested should start, is a very good player but he too is getting on in terms of age. In my opinion, O’Neill should give new players a chance, Seanie Maguire is one player to note. He moved from Cork City where he was scoring on a weekly basis in the League of Ireland and he is now with Preston in the English Championship, Daryl Horgan also needs to be given a chance, he is another player at Preston and is playing quite well. In the Irish attack Shane Long has hit a dip in form in recent games, so may be a change is also needed in attack perhaps the aforementioned Maguire could fill this role beside John Walters. If Ireland had won in Georgia they wouldn’t be in this position in my opinion. How they didn’t beat a team nearly 80 places behind them is beyond me. If they are to qualify they will need to bring the performances that they have done in the past like when they beat Germany in the Aviva and beat Italy in the World Cup in 2014. When Ireland need to win games they normally tend to raise their game and hopefully for Irish fans they can do this in the next two games or they will not be on the plane to Russia next summer. If they beat Moldova, play well and score a few goals, confidence will be high going into the Welsh game. It will be all or nothing in that game and I am like many fans looking forward to it.